An absolute reference work in terms of traditional live US metal. I am from an epoch in which live albums were usually assigned a much higher status than the respective studio recordings of a band. Live discs were at the time something of a band's business card. For example, think of KISS with her two "Alive" discs, IRON MAIDEN with "Live After Death" or JUDAS PRIEST with "Unleashed In The East". Sadly, those times are long gone and live recordings are now largely a bonus supplement to a regular studio album to give shoppers an extra buying incentive in times of massively declining sales. That's why I enjoy it all the more when smaller, even less known bands still choose the courageous way of a live release. If the final result turns out to be as good as in this case, I feel like I'm in seventh Metal heaven. 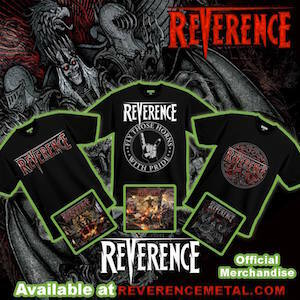 Detroit-based REVERENCE is on of those bands, and with "Vengeance Is ... LIVE" it releases no less than an absolute reference work in traditional live US metal. Founded in 2010, the band currently consists of Scott Oliva (ex-WIND WRATH, INNERSTRENGHT) on vocals, Steve 'Dr. Killdrums' Wacholz (former SAVATAGE / CRIMSON GLORY) on drums, Bryan Holland (ex-TOKYO BLADE) on guitar, Paul Kleff (former METAL CHURCH Live, FIREWÖLFE) also on guitar and Russ Pzutto (TWISTED SISTER Live, DEE SNIDER) on the bass. After two EPs as well as the two high-quality longplayers "When Darkness Calls" and "Gods Of War", which by the way were vocally refined by the then frontman Todd Michael Hall (RIOT V), it was time to make the world of their extraordinary to convince live qualities. "Vengeance Is ... Live" contains 15 pearls of the finest US power metal and boasts a total playing time of over 75 minutes. From their last year released EP "Foreverence" are found with 'Fire Lord', 'Phoenix Rising' and 'New Order' all three newly composed songs again. With SAVATAGE's 'Power Of The Night' and IRON MAIDEN's 'Wasted Years', there are also two first-class cover songs on the album that fit seamlessly into the overall picture without stealing the show's original compositions, which is a huge compliment to REVERENCE look. Singer Scott Oliva, with his masterly vocals, often recalls a more metallic version of Zak Stevens' (SAVATAGE, CIRCLE II CIRCLE) and more than forgoes his predecessor Todd Michael Hall for his magnificent vocal performance. In addition, on the unadulterated produced album you will find a lot of extraordinary guitar riffs and enthralling melodies, suitable for the low knees. However, if one desperately seeks for the so-called hair in the soup, one could feel the unnecessary breaks between the individual songs as slightly disturbing, since they hinder the flow of the concert a bit. Nonetheless, the disc, which was also provided with a stunning artwork, convinced from the first to the last note and belongs without exaggeration to the best from America coming live releases of recent years. Every quality-conscious US Metal fan who counts bands such as METAL CHURCH, SAVATAGE, RIOT, IRONFLAME or VICIOUS RUMORS among his favorites should make it to this album!